Welcome to the Tiffany Doodles sneak peek! 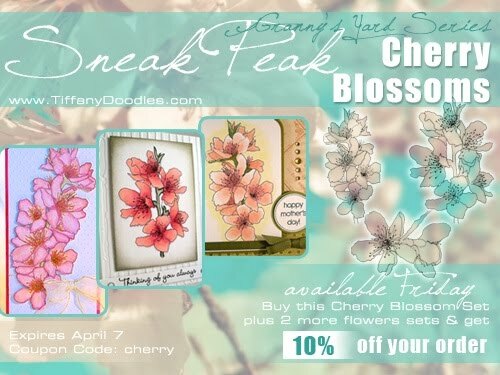 This Friday Tiffany will be releasing a number of beautiful new floral images, including this new Cherry Blossom image. And if you purchase any of the new sets you can take 10% off of your order! Here's the card I created with this stunning image. I kept the image large (one of the nice things about digi images is that you can make them whatever size you like) so that it would fill the majority of the card. I colored the image with Copics and paired it with beautiful vintage paper from Graphic 45. The sentiment is actually one that I just picked up from Wholly Scrap! ; part of a set from TPC, rhinestones are from Little Yellow Bicycle. Enjoy and be sure to check back to the Tiffany Doodles site on Friday for all of the spring-time, floral goodness!! Happy Monday bloggers! Hoping everyone had a wonderful weekend! We had a sick-filled weekend with both kids so a lot of time spent on the couch, watching cartoons and administering Tylenol! But these times do give me an opportunity to catch up on my reading and blog surfing!! We're still down for the count this morning but I wanted to share a little sneak peek of a Sweet 'n Sassy stamp set that will be released on April 1. This one is so darn cute, I love it and can see a bunch of uses for this set. For today's card, I went with a welcome baby theme, using the lion, stand, and precious baby sentiment. I started by stamping the stand on cream cardstock and then using collage number stamps (a retired SU! set) to decorate the background. (I masked the stand). I then colored the stand with Copics and aged the edges of the cream cardstock with Walnut Stain Distress Ink. The lion was stamped twice on a separate piece of cardstock and colored with Copics. The lion was cut out and adhered on top of the stand with foam tape and then his face was cut out of the second lion and attached with foam tape for that much loved dimension. The image is paired with a piece of designer paper from October Afternoon and a piece of scalloped cork was added next to the lion. 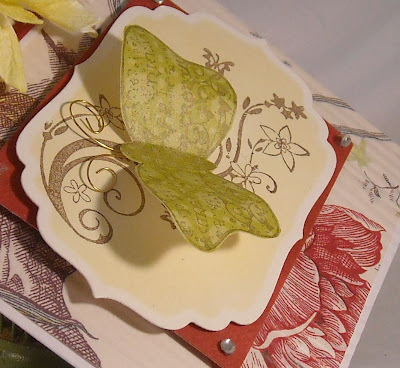 (I finally broke down and purchased one of those large scallop dies from Papertreyink!) A few buttons and the sentiment finished off my card! Enjoy and be sure to mark your calendars for April 1st! Sweet 'n Sassy will be releasing a wonderful line of new stamp sets!! Oh, and right now there is a 30% sale on all digi images! Go to the web site here. How about a total change of pace today! 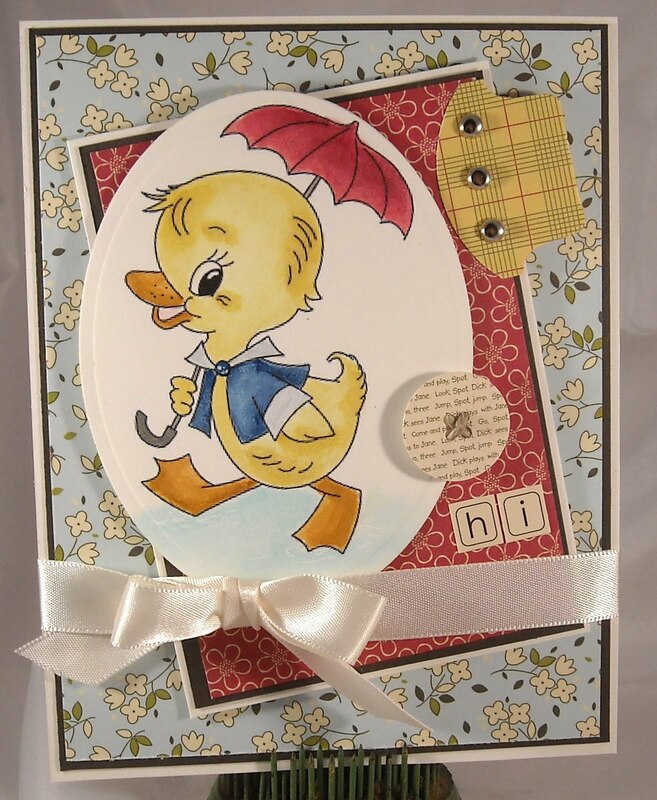 A KSS card created with a sweet (or should I say tweet) bird set from Papertreyink. Lately I've realized that many of my stamps haven't been used in ages so I'm trying to use some of them more frequently and since I had a sicky kiddo at home this week, I had a little bit of free time to just play. This card was created using the Bird Watching set from PTI. This set was designed by Melissa Bickford, who was one of our teaching at the Stamping Around NH event. Papertrey and Melissa were amazingly generous and raffled off a ton of free stamp sets. I'm pretty sure that everyone in attendance went home with a free set! This is the one that I received...love it!! I simply stamped the bird image four times, in four different colors, and layered the stamped image on to matching cardstock. 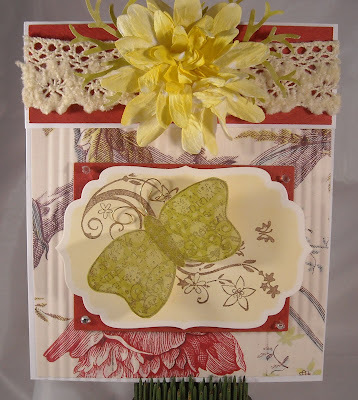 Then a few strips of October Afternoon paper is all that was needed to finish this card! Oh, and a tweet sentiment!! Enjoy! One more page for January! The title of this one is Cluck and is about our chickens spending their first winter outside in their coop. (When I showed this page to my husband he asked, "Who is Chuck?" hee hee I guess he read the title too quickly!) This is another simple layout, based on a few pages submitted by one of the Wholly Scrap! design team members, Nicole Wise. I love this layout for adding multiple pictures to a page...it's a bit like a film strip. For this layout, I used a large photo of our barn and coop as the main image and then a few photos of the girls (how about Brownie riding on the Power Wheels! She's a crazy chicken! ), and our camper buried in all the snow. More Bo Bunny paper and brads finished off this page. Easy peasy! Enjoy! So why don't we continue with the January scrapbook pages review! Sharing on my blog might keep me from falling too far behind schedule...I'm determined to try and get a month's worth of photos scrapbooked each month. Hum...I have a week left of March and I haven't even thought about the February pages; I better get moving!! For these two pages, I continued using the Bo Bunny paper and embellishments. 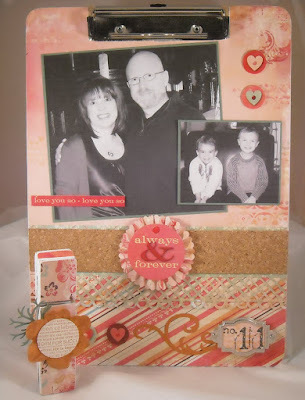 I'm finding that keeping my scrapbook page layouts very simple is the key to moving along at a good pace. For these pages, I only added "hills", hand cut from the snowflake paper, and a thin band of designer paper at the top of each page. After I add my photos, I start thinking about adding layers and embellishments. I again used a few of the snowflake stickers that came with this paper line, a scalloped border (created by a Martha Stewart punch), brads (to keep with my row of brads theme from yesterday's page), a few rhinestones, and the title, which I broke up between the two pages. I was a little challenged by where to put journaling; every spot I considered seem to throw the page off balance so I opted to write a few notes along the hills. This is a tip I learned from one of the Wholly Scrap! design team members! 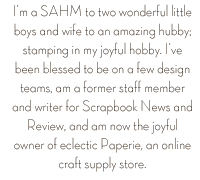 :-) Oh, I should also mention that all of my supplies came from Wholly Scrap!, the store where I work and teach and where I can't seem to stop buying paper!! LOL! Enjoy! Remember I said that I started scrapbooking? Here's my very first page of my very first scrapbook album! I'm so excited! I can't believe how much I'm looking forward to scrapbooking some of our best photos from this year!! My plan is to create a hybrid 12x12 scrapbook, which means I'll scrapbook some of the pages and then put the rest in to standard 4x6 photo holders, as you see below. For me, that takes off a lot of the stress since I'll focus on only scrapbooking our favorite photos. I'm also focusing on one month at a time so just a few photos from each month. For my first few pages from January, I started with designer paper from Bo Bunny. 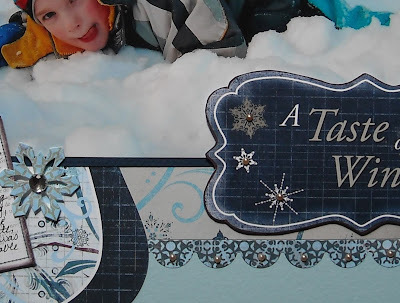 I love the dark navy of this page, along with the snowflake design and all of the coordinating stickers and embellishments...ohh, fabulous!! The January title on this first page is from a sticker sheet that goes along with the paper line, as well as the various snowflakes on the page. I really only added a journaling box (also from this line), a few brads (a theme I repeated on all the January pages), the photo of my most handsome son, and tiny pearl accents, which you can just see on the inside of the snowflakes in the above photo. Well...that's page one...what do you think?? I have four more pages to share for January, which I'll do within the next week or so... Enjoy!! The Japanese Magnolia image that I used on my card here is now available for puchase/download from the Tiffany Doodles web site! I used the colored digis on my card, however, the same images are available without color so you can add your own creative spin to the image! 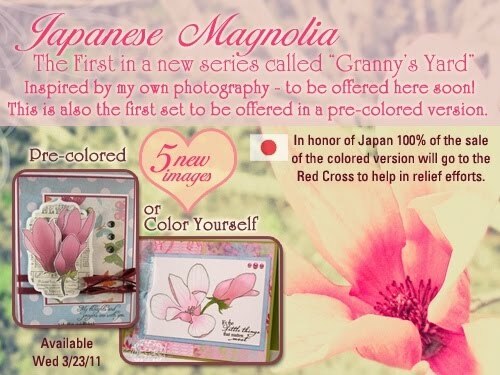 Enjoy and remember that 100% off the proceeds from the purchase of the colored digi set will be sent to the Red Cross to help with relief efforts in Japan. Happy Tuesday morning blogging friends! Today I'm sharing a Spring card because I've just got to see to see some flowers soon...especially since it was snowing all day yesterday here in New England. Talk about being shocked at seeing snow coming down yesterday, after we'd had days and days of beautiful, sunny weather! Oh, that's right...We live in New England, one never knows what one is going to get on any given day! :-) I had the wonderful opportunity to create one not but two Sweet 'n Sassy cards last night, which was a real treat considering March has been so busy. And on both cards, I took a more simple card making approach, having recently been inspired by one of my design team buddies, Jill Foster. 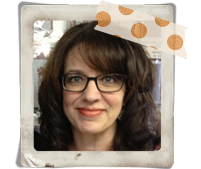 If you've never visited Jill's blog, I encourage you to check it out! Jill takes cards from other designers, who inspire her, and then she creates a card based on their designs. Jill's cards sport bold and vibrant colors and clean and simple designs. And today...her card inspired mine! :-) This sweet Tulip image is currently available as a digi image from Sweet 'n Sassy. However, I have a little secret for you...In another week or so you just might be able to purchase an entire set with this beautiful design and a bunch of sentiments! April 1st is release day at Sweet 'n Sassy so...you'll just have to visit the site on the 1st to find out what's new! As for the card creation, no designer paper! I took a clue from Jill and used the a sanded background stamp to decorate my first layer vs. decorative paper, which was cut out with a Labels Nestibilities die. I then used a word background stamp to decorate the cream layer and here's a fun trick I learned from Jill. I applied ink to the entire stamp and then used a damp cloth to remove some of the ink before stamping. It kind of gives the image that vintage look and also makes a blank space if you want to layer your main image directly on top of the background image, as I did with the tulip image. I then stamped the tulip image a second time and colored the flowers with Prismacolor pencils. (Loving the pencils!) Once the flowers were cut out and attached with foam tape, I simply added the sentiment and ribbon. Fun!! Enjoy today's card and be sure to check on the SNSS site on April 1st! Greetings all!! Today's KSS card may not seem that simple, what with all those layers, but since I used a brand new pre-colored digi image from Tiffany Doodles, this card took me just minutes to create!! Can I just tell you how much I love printing out an already colored image...how totally cool is that? And the coloring on this new digi image, Japanese Magnolia, is simply beautiful! The best part, a portion of the proceeds from that sale of this image will go to the Red Cross to help with the efforts to help those affected by the destruction of the recent earthquake and tsunami in Japan. My heart and prayers go out to that country and all the tragedy that they are currently experiencing and I created by card with those thoughts in mind. Beside the digi image from Tiffany Doodles, which is a set that includes five images, my card also showcases new designer paper from Kaiser Craft and a tiny sneak peek of a sentiment that will soon be released from Sweet 'n Sassy. 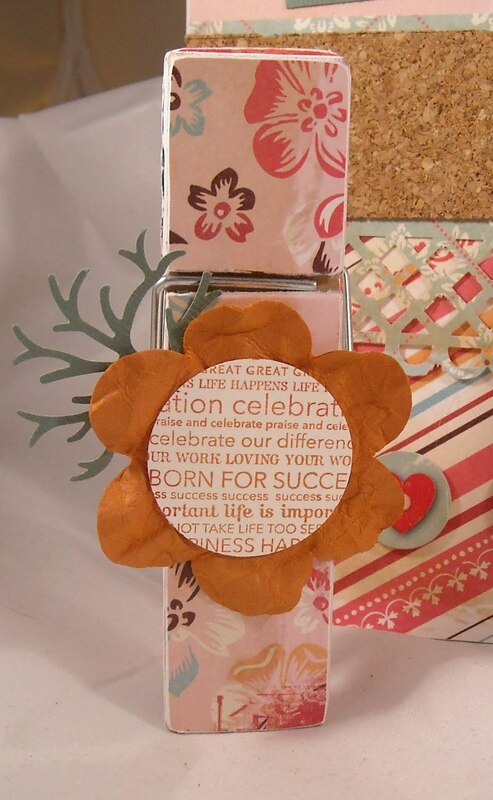 The newsprint background behind the flower image is a new stamp set from Papertreyink. Enjoy and please visit the Tiffany Doodles web site to see the new images. Tiffany also has a link to the Red Cross if you feel so inclined to donate. Oh my goodness! I stamped and I had a chance to create this week...finally! I've actually been creating but it's been in the form of scrapbooking. That's right! I finished all of January's photos and completed four scrapbook pages for my very first album! I am super excited and can't wait to share the completed pages!! But for today's project, I'm sharing something that I demonstrated at a Wholly Scrap! class last night during our Anything but a Card class. To start, we made this sweet paper box that held four tile coasters. This is a super easy box to make, I think a fairly standard pattern. For this box, the bottom is 8" square and is scored every 2". The top is 6 1/16" square and scored every 1". Once you cut out and score both squares, you'll see how to assemble the box. Easy peasy! These are plain tile coasters that I purchased at Lowes for .32 cents a piece. The first coaster made is just a plain black and white piece but I love this look! It's one of the brand new Tim Holtz stamp sets called Air Travel. Isn't it the greatest designs! Make sure you use Staz-On ink when stamping on coasters! The next coaster is again all black ink but with a twist...This time I colored the background of the coaster before stamping the tree and sentiment images. (This is a Papertreyink set, Through the Trees). I used torn paper and a sponge to create the hills and a punched out circle for the moon. The next one is straight forward stamping on to the tile, this time using colored ink. This is the Life set from Papertrey, one of my favorites! I should also note that I used Pallette ink pads (purchased from Papertreyink) for these tiles. It's important to heat set the ink, both the Pallette and the Staz-On, in order for the ink to be waterproof. No matter what the Staz-On ink pad says, it is not waterproof on this type of material. I heat set my tiles in the oven. Set the over to 275 degrees and bake for 20 minutes. Turn off the oven but leave the tiles in the oven until the oven is completely cool. You might want to also coat the tiles with a waterproof sealant to protect them from water. The other option, and I'd gladly show this option but Blogger doesn't seem to want to allow me to move my photos tonight, is to use glass paint, which can be purchased at any craft store. The glass paint can be applied directly over the Staz-On inked image and then follow the baking directions on the paint bottle. This is a super easy and fun project to make and are wonderful grab bag and housewarming gifts. I've even sold these in sets at craft shows and they are a big hit! Enjoy! I finally made a card and it felt so good!! :-) It's been too long since I've created a card and I had a great time making this one last night, featuring a soon-to-be-released digi image (tomorrow) from Sweet 'n Sassy. Isn't this a beautiful image! I loved it the moment I saw it and couldn't wait to create a card showcasing this wonderful bird image. My image is paired with designer paper from October Afternoon (Cherry Hill line) and ribbon from Papertreyink. My image is colored with Copics, sentiment is from SU!, and I also added a few rhinestones for just a little bling. Enjoy and hop on over to Sweet 'n Sassy to check out all of their new digi releases!! I'm happy to annouce the winners of the blog candy drawing!! Ladies, please contact me at ksdm@comcast.net with your address and I'll get your goodies in the mail! Congratulations! Let's face it...I have more designer paper and other crafting stuff than I know what to do with...so...I'm going to offer some blog candy surprise packages for three random people who comment on today's post and answer the following question: What is your favorite type of candy? Is it chocolate, something with nugget, or caramel? Me? I'm partial to anything that contains a chocolate/caramel combo. Anyone have a candy bar to spare? And right after I start cleaning up my craft room and packaging up three surprise packages (packages will come with mostly designer papers, some full sheets, some smaller, and a few other goodies thrown in), I'll get back to blogging but right now I can't even find my room!! :-) You have until tomorrow night at midnight (EST) to enter!! Welcome to March's Sweet 'n Sassy Customer Blog Hop! This is such a fun event and a great opportunity to see not only the design team's work but also creations made by our customers! And the best part? You have a chance to win free product!! You can read the full details on the hop here. So...this month's theme is "Think Spring" and we are definitely ready for some warmer weather here in New England! And as much as I adore all things flowery and springy, I got very distracted by this brand new, super cute digi image, Chugging Along. I mean isn't it just adorable! And since my sweet boy's birthday was yesterday...well....I just had to go with a card that would give a little nob to him. But I did use a few bright colors in my card, does that count?? :-) For my card, I printed the digi out on Prism Smooth cardstock and colored the image with Copics. I then created my card layout, based upon an old Mojo Monday sketch. The paper I used is from My Minds Eye. I created a cloud covered background for the train (I used a hand cut template and sponge to create the clouds) and then cut out the train and attached it with foam tape. I used the sentiment to make a cloud of smoke coming out of the train's smoke stack (is it called a smoke stack??) And then I loaded up the train cart with a bundle of hearts...which, as my son would say, means I love you. Enjoy today's card and stop by the Sweet 'n Sassy digi blog to sign up for the blog or to just hop along and view the artwork! Welcome back bloggers! It's been a busy few weeks (this one continues to be busy as we prep for our son's 7th birthday! Someone tell me where the heck seven years just went??) but I wanted to take a quick break to share a Wholly Scrap! class project with you. Last month, we started an "Anything but a Card" class, which is held once a month and allows us to use rubber stamps on projects other than cards or scrapbook pages. Last month we created these fun altered clipboards and clothespins. (And I confess that I added a bit to this project after this photo, such as ribbons on the clip portion of the clipboard.) The paper I used on this project is from Cosmo Cricket and is all things love so I opted to use my clipboard to hold a picture of my sweet hubby and two smoochie boys. The hearts and 'always & forever' sentiment are stickers that came with this paper line. Here's a close up shot of the clothespin. I painted the sides of the clothespin with white crackle paint and then added the designer paper. The flower was created with a SU! flower punch. I crumpled up the flower until the paper layers separate and then attached one of the flowers, with a wordy center, to the clothespin. Because the cardstock had some texture to it, the crinkling gave it a bit of a leather look. It's way cool in person, man. And see that green viney thing (that's a technical term) behind the flower? It's actually a tree punch! The tree trunk is hidden under the flower so you can only see the branches. Looks like leaves or vines, right? Sometimes my small brain comes up with something interesting...LOL! Enjoy today's project and be sure to check back on 3/11 for the Sweet 'n Sassy customer blog hop!! Happy Monday bloggers and welcome to this month's Tiffany Doodles challenge! This is your opportunity to participate in a fun challenge and be entered in to a drawing for wonderful prizes! Our challenges last for two weeks so you have plenty of time to create and post! In March, our challenge was to create a card based on a photo inspiration, which you can see here. For my card I used the Daphne Flower image. A wonderful digi image, available now for download for only $3.75...fabulous! I colored my image with Copic markers and then added a few white gel pen marks on the flower centers. The image has been paired with brand new paper from Little Yellow Bicycle called Twig. I kept this card fairly simple so the main focus would be that lovely floral image; I only added a sentiment (from SU!) and three silver brads. So...how about the rules for the challenge! The dates! Start date: Today, March 7 End date: March 21, Midnight EST Winners Announced: March 21 The challenge! 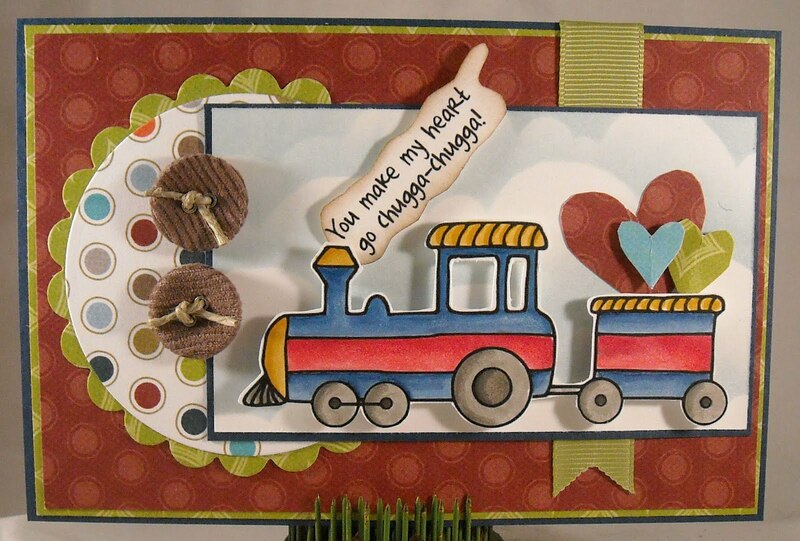 Create a love-themed card or project. Don't forget to add your card to the Tiffany Doodles Flickr Gallery! Tagged with: TD09 The Prizes! You have two chances to win Tiffany Doodles gift certificates! 1st place - $10.00 gift certificate (Note that you must use a Tiffany Doodles digi image in order to qualify for this prize) 2nd place - $5.00 gift certificate (This prize will go participants who do not use a Tiffany Doodles digi image) Want to see what the rest of the team came up with? You're in for a treat, their designs are amazing! For details on any of the team cards just click on their name to visit their blog! Tiffany Doodles Tiffany Richards Cammy Wall Collette Landwer Donna Mikasa Jeannie DeGruccio Jill Foster Jodi Ann Lee Joy Taylor Karen Baker Lindsay Amrhein Lisa Summerhays Pattie Goldman Peet Roeven Shannon Neparko Simone Naoum Sue McRae Willemien Katerberg Oh, and I also want to announce the winner of the Tiffany Doodles duck image, which was used on Friday's blog post.....Keely Yowler! Congratulations Keely, I'll be emailing you the duck image this week! Welcome to this month's Tiffany Doodles blog hop! Aren't these hops so much fun? You get to see oodles of lovely cards, designed by the wonderful TD design team and it's an opportunity to see the amazing digi images offered by Tiffany Doodles! This is a three day blog hop so you have three full days to participate (March 4-6). You must sign up to follow every blog and comment on every post in order to be eligible for the prizes! And boy do we have prizes!! Every Design Team member is giving away a Tiffany Doodles Digital Stamp at their blog! Plus, there will be a Grand Prize at Tiffany Doodles Blog! 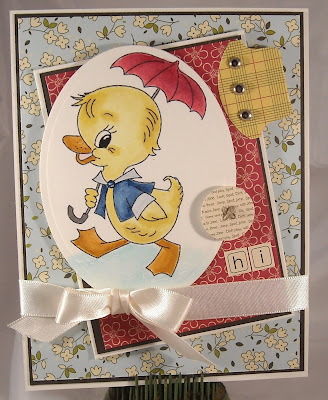 I'll be giving away the darling image used on my card, Ducky Umbrella and all you have to do is leave a comment, with your email, and sign up to follow this blog! Along with my so sweet image, I used paper, paper button, and letter stickers from Jillibean Soup and ribbon from Papertreyink. The image was colored with Copic markers. And don't forget that the Tiffany Doodles card challenge starts on March 7th and last for two weeks! It's another opportunity to win great prizes!! Last but not least, Tiffany Doodles will be hosting two great sales in March; see the badge on the right for details. Be sure to stop by the TD store and take time to wander around, you never know what you might find! Tiffany Doodles is now close to 50 stamp sets in inventory! Enjoy and be sure to stop by the other design team member blogs, listed below! Here is our Blog Hop Map! To qualify for prizes you must do two things: 1) Follow every blog 2) Comment on every Blog Hop post! Thank you and enjoy your journey through some inspirational cards and spring creativity!! Kim Schofield Paperie Petals You're here! If any of you were ever Stampin' Up! demonstrators, I suspect that you've created one of these pocket cards from a standard card envelope. This is a project that I'll be demonstrating at a Wholly Scrap! class next week. The fun flower at the top of the pocket is from Petaloo and comes as a white flower that you can color - how cool is that? I simply colored the petals with my Copic markers but you can use paint or chalks as well. The outside of the envelope was decorated with a sweet butterfly image, and swirl, from Unity Stamp Co. and Anna Griffin designer paper. The ribbon on the top of the card is soft, fuzzy ribbon from American Crafts. The inside card is a one layer card that includes a sentiment, also from Unity. I will admit that on this card I was having some fun with my Nestibilities, mixing up the shapes. Oh, I'm so trendy. 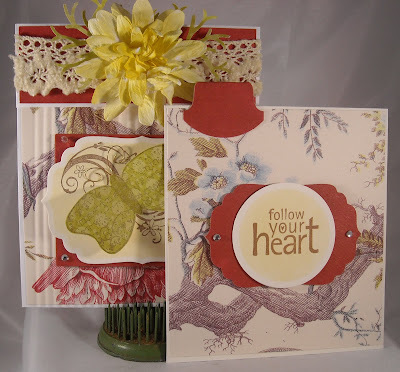 ;-) In just a few days I'll be attending our Stamping Around event, so excited, and on Friday I'll be posting a Spring-inspired card for this month's Tiffany Doodles blog hop so stop by over the weekend for more crafty goodness! Enjoy!